Elouise Elizabeth Hayes-Purswell, 93, peacefully passed away in her home in Apache Junction, AZ on November 12, 2014. She was born on January 9, 1921 in Silsbee, TX to Christine Elizabeth Collins and Benjamin Harrison Hayes. She was raised by her mother and her step-father Harry Houston Knight. She was preceded in death by her husband of 64 years, Robert Earl Purswell of Cleveland, TX. She is survived by her three children, Beverly Purswell, Barney Purswell and Marilyn Musick, nine grandchildren and ten great-grandchildren. She is also survived by her sister Earline deLeon and her husband Dr. Joe deLeon of Mexico and their two children. Elouise lived in TX, CO, OR and AZ. She had her BA in music education and her MA in elementary education. She taught school in CO and OR and ended her teaching career with 15 years of teaching in Crockett, TX. After retirement she and her husband enjoyed traveling and living in their motorhome and spending time with their family. She was an accomplished cook, pianist, and enjoyed traveling, hiking, trying her hand at billiards and an occasional tennis game. There are no services planned and her ashes will be joined with her husband’s ashes. Contributions may be left in her name to a charity of your choice. Elouise was a great lady. I have several wonderful memories of time spent in her home, playing games, and enjoying her great cooking. I loved her green chili. She was a great role model in taking care of your self. 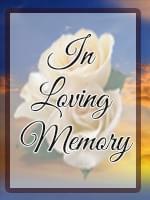 Bev., Marilyn and Barney I am thinking of you and understand your loss. Our condolences go out to you. You are in our thoughts.